Come home to this extensively renovated home with many upgraded features. Nice flowing floor plan with endless possibilities of how to use the space. Ideally set up to be an entertainers delight, you will appreciate the new feel of the house while maintaining the charm of its history. The stunning gourmet kitchen offers everything the serious cook looks for from stainless steel appliances, center island plus an abundance of white cabinetry. Another added bonus is an inviting master suite complete with a large walk in closet and its own patio space for relaxing after a hard day. 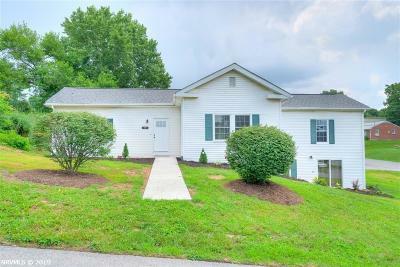 Located on a large corner lot just a couple blocks from the center of downtown Christiansburg; you'll love being so close to everything while having easy access to all points of the NRV. Directions: Take N Franklin To 2nd St SW, Home Is On Left Corner At Intersection Of 2nd St And Hickok St Nw.